May was a big month for our team. From finishing the mechanical side to prototyping the robot to deciding the future of the entire InvenTeam, we certainly have been busy. We finished the mechanical side of the robot early in the month. This allowed us to run software testing of conveyors. As you may have seen, we were also privileged to test our robot in real water in the Willamette River. Unfortunately, this testing did not run as smoothly as pictured in the video. The robot almost sank due to an open pontoon valve, and the amount of force on the transmissions distorted the drive shaft to a point of no repair. Thus, the rest of the month mechanically focused on fixing the transmissions and attempting to reduce risk of this happening again. In order to accomplish this, we have decided to re-make the paddle wheels. Their new smaller size will make for a lighter robot and less force on the drive shaft-- hopefully solving both of our problems. On the communications and marketing side of the team, preparations are underway for the final presentation at EurekaFest. The final powerpoint has been constructed, a reveal video was made, and work has begun on brochures and posters for the presentation. The Facebook account is frequently updated as well. You may be wondering: what's next for ScumBot? Our team has been in careful consideration of this question for the past few months. After lots of deliberation considering what our team's abilities for next year would be, we have decided to work hard on ScumBot until July, when we will go to Sunriver for testing. During this time, we will pass ScumBot off to FRC Team 753: The High Desert Droids. Their location and previous experience with engineering through FRC makes them the ideal candidate for taking over this project as it moves to its final destination. May 14, 2014: ScumBot Testing in Water! Last week, ScumBot ventured outside, got mounted onto a trailer, and traveled to the Willamette. Although there were a few mishaps, including water getting inside our pontoon, we were able to innovate and ScumBot successfully floated. In this video, see our successful testing day out on the Willamette River. Enjoy! This month has been a busy month across the board as many of our members travelled to the FRC World Championship in St. Louis. Meanwhile, the remaining members worked hard to attach conveyor belts and devise a strategy to move the completed ScumBot out and test it. Unfortunately, we have not quite finished everything mechanically, but that should be done by the end of this week. Mentioned above, we have attached conveyor belts, which were hugely difficult to obtain up until this point. We ended up using tread to make the belts. Also, ScumBot now features a removable motor plate and paddle with Andersen connectors to our motors. This will help with transportation out of the lab, since ScumBot is too wide to fit through the double doors without removal of the paddle wheels. And ideally, we will need to transport it out those double doors very soon! On Friday, May 9th, ScumBot makes its first official trip to a body of water in our very own pond on campus. Here we will test the basic functions, mostly its flotation with extra weight. Communications-wise, we are scheduled to present to the entire Upper School on May 20. We will hopefully be able to bring ScumBot into the auditorium for demos! And there might even be a video showing. Click on the photo to change views. Hello everyone, I hope you are having a nice morning. Thanks to everyone who came out to the Midterm Review last night! In spirit of that event, this month's report will be slightly different than usual, mostly focusing on what we had in our presentation. You can view our presentation here: http://prezi.com/63qw6xss07oi/?utm_campaign=share&utm_medium=copy. We started out the evening by welcoming our guests and introducing all of the presenters: Alexandra, Jacob, Max, Mind, Jason, Vincent, and Anna. We then launched into the presentation. People trickled in as we were playing the Lemelson-MIT video, which worked out nicely. We had a much bigger turnout than we had expected; about 20 people were present and one person even Skyped into the presentation! Thanks again if you were able to come. In our presentation, we touched on all of the important parts of this project, including the problem we are trying to solve, our solution, and what improvements have taken place in the past month. Our robot has definitely come a long way. See attached photos and view our newly added photo gallery called In Our Lab. Communications wise, the main focus has been on the review; preparing the presentation and getting people to attend. Make sure to like us on Facebook if you haven't already: https://www.facebook.com/catlininvents. Financially, our budget is running low, as we have spent approximately 9,900 of our allotted 10,000 dollar grant. Luckily, the mechanical side of the robot is nearly complete, so if nothing breaks, we won't need to purchase anything more. Due to the break, our team will not be in the lab in the last two weeks of the month, so you all get the monthly update now! Mechanical: The motors have been mounted, after a few difficulties with measurements. Max has placed several calls with Rexnord Industries concerning the conveyor belts, but they are still working things out. The next steps will be to figure out a way to attach the conveyor belts and paddle wheels. Meanwhile, Jake has continued diligently working on his CAD of the robot. Software/ Control Systems: The joystick is now fully functional in controlling Captain through an XBee radio, the mechanism we intend to use on ScumBot. We now have some navigational code for controlling the robot autonomously from afar, but we will not be able to test it until the GPS system arrives. Everything is going smoothly in control systems; the components are all mounted on Captain. Financial/Communications: Having already purchased pontoons and control systems parts, the financial department has been spending quickly. Our budget is looking tight at the moment; conveyor belts will likely take a large chunk of our remaining budget to purchase, so we hope to receive a donation. The receipts will be mailed to the Lemelson-MIT program by Friday. Speaking of donations, we recently received mechanical parts from Igus, including shafts, bearings, and other useful fabrication materials. Be sure to check out their website and look at our other sponsors. You can find the link here: https://catlininvents.squarespace.com/sponsors. That’s all for this month. We hope everyone has a great winter break! Following the break, some of our members will dedicate most of their time to FRC for six weeks, so we must be resilient and work harder than ever in order to get work done. "You all are wonderful and technical leads. You've done great work so far this year that is AMAZING. Guess what? We're half way to the approximate date of our first test run in Sunriver, but of course we'll do test runs here before we go to Sunriver. The Scumbot is a huge project and we have to keep this in mind with these upcoming, real deadlines. SO for this week-and-a-half push I'm going to make brownies! If people can accomplish the goal they set in the last InvenTeam managers meeting, then they get brownies. However, the amount and quality of the brownies you receive depends on how many days and hours you put in over the next week and half. These brownies will be brought into the lab on Wednesday December 18th." Let's see which department gets the most and best brownies! Good luck to all! Exciting news! Our team has decided to apply for a patent for ScumBot! Jacob Bendicksen’s cousin, Laura Moskowitz, works in patents, and she has agreed to help us with this new process. Thanks Laura! We’ve definitely made progress this month, in both technical departments and outreach. Below you’ll find department reports for November. Fabrication: Pontoons arrived early in the month, which turns out to be a bit of a setback. The pontoons do not fit the original measurement description. Luckily, we have such a great fabrication department. Max A and his team adjusted the measurements of the robot to fit with the pontoons within a week. Additionally, in the Fabrication department, a major design change has been set in place. We have decided to use wider conveyor belts that cover the entire width of the robot. This will maximize time and power efficiency. Software/Control Systems: The robot is now driving with a remote (as opposed to connected by cable to the computer). That means we are now able to drive the robot around the lab. In control systems, Jacob’s been busy with coaching his FLL team, but he says that the spot on the robot for the control box has been finalized. Communications: We’ve now got both a Facebook page (https://www.facebook.com/catlininvents) and a Twitter page (https://twitter.com/CGInvenTeam) where we will be posting updates about our team. On Wednesday, November 20, Alexandra and I met with other teams regarding the communications role. We also familiarized ourselves with Google+. Finally, there are still five more days left to vote for the engineering video by Jules Renaud here: http://app.snapapp.com/ROKEngineeringOurFuture. We are the last thumbnail on the fourth page, with four books. Financial: The debit card came in the mail early in the month, and everything is running smoothly. Currently, the biggest predicted expense for the robot will be conveyor belts; the price is estimated to be around $1500. The lab's closed for the break, but we will be back and working harder than ever in December. Happy Thanksgiving to all. Recently, the Sunriver Scene published an article about our project. The article is on page 10. Make sure to check it out if you haven't already! This is the first of the monthly updates, so you’ll have many more to look forward to. In these analyses, we will cover what’s been happening in each department. Electronics/Software: Good news from control systems. We’ve been testing out our fancy new part, the voltage converter, as well as software’s new drive code. The only full-time member of the software department, Vincent, has been working very diligently on robot software. Vincent has been working alongside Jacob, testing his drive code while Jacob experiments with controls. On Tuesday, our prototype control board and software was successfully able to drive! We are currently using old FRC drive base and control board elements to test out our new equipment. 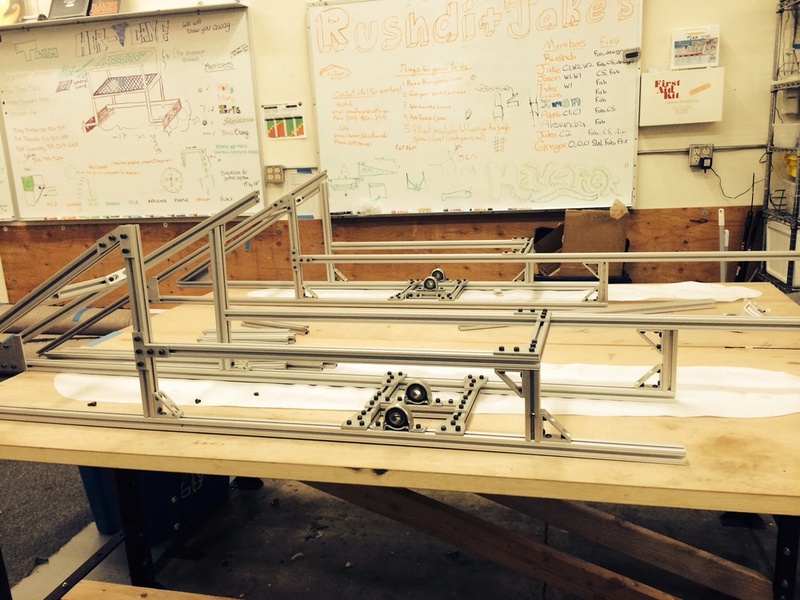 Fabrication: In fabrication, the 80/20 frame for the robot is complete (see picture below). Hopefully, our pontoons will arrive shortly and we will be able to attach them. We have also been exploring new ways of propelling the robot. Right now, paddle wheels of some type seem to be the obvious choice. However, we would like to possibly investigate ways of using snow mobile tracks to tread the water in the future. Communications: Communications is up and running with Anna, Tristan, and Alexandra, the current task being all members needing to turn in their permission slips at Team Access online. The website is adding new content all the time, so be sure to check back frequently. Financial: The financial department awaits the debit card, so there is not much for them to do right now. Thanks again to Mind for stepping up to the management role. Yesterday, Leigh Estabrooks and Justin Lai traveled all the way from Massachusetts to visit our school. The main purpose of their visit was to obtain a better understanding of our project, and to help our team visualize what is needed in terms of management, particularly finances. Mind Tienpasertkij has shown interest in this area, and has agreed to take on the challenge of being finance manager. Please join me in congratulating her. Reflecting upon his visit today, Justin Lai remarked, "It was great to meet you all and see the beginnings of your project. I was glad to see your great energy and effort so far." Thanks, Justin! We are grateful for your help and we were glad to have you and Leigh here today. Hello, world! This is the area where we will be providing weekly updates on what's happening with the Catlin Gabel InvenTeam. Major progress, news features, and important meetings will all be reported here in addition to the weekly updates. Check back often and see what's new! There always seems to be something exciting happening!